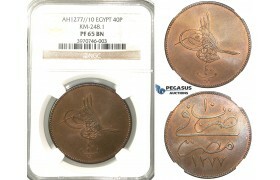 AA238, Ottoman Empire, Egypt, Abdulaziz, 4 Para AH1277/4, Misr, NGC MS64BN ..
AA239, Ottoman Empire, Egypt, Abdulaziz, 4 Para AH1277/4, Misr, NGC MS64RB ..
AA381, Ottoman Empire, Egypt, Abdülhamid II, 1 Qirsh AH1293/4, Misr, Silver, NGC MS61 ..
AA591, Egypt, Silver Gilt Medal 1937 (Ø50mm, 50.4g) by Huguenin, Montreaux Conference, Abolit..
AA655, Ottoman Empire, Egypt, Abdulaziz, 4 Para AH1277/4, Misr, NGC MS65RB ..
AA656, Ottoman Empire, Egypt, Abdulaziz, 4 Para AH1277/4, Misr, NGC MS64RB ..
AA657, Ottoman Empire, Egypt, Abdulaziz, 4 Para AH1277/4, Misr, NGC MS64BN ..
AA658, Ottoman Empire, Egypt, Abdulaziz, 4 Para AH1277/4, Misr, NGC MS63RB ..
AA659, Ottoman Empire, Egypt, Abdulaziz, 4 Para AH1277/4, Misr, NGC MS64RB ..
AA660, Ottoman Empire, Egypt, Abdulaziz, 4 Para AH1277/4, Misr, NGC MS64RB ..
AA661, Egypt (Occupation Coinage) 20 Piastres AH1335 (1917) Silver, NGC MS64 (Undergraded) ..
AA662, Egypt (Occupation Coinage) 20 Piastres AH1335 (1917) Silver, NGC MS63+ ..
AA664, Egypt, Fuad, 10 Piastres AH1348/1929, Silver, NGC AU58 ..
AB017, Egypt, Occupation coinage, 2 Piastres 1917-H, Heaton, Silver, NGC MS63 ..
AB161, Egypt, Fuad, 10 Milliemes 1929 BP, Budapest, NGC MS62 ..
AB162, Egypt, Farouk, 5 Piastres AH1358 / 1939, Silver, NGC MS63+ ..
AB163, Egypt, Fuad, 10 Piastres 1923-H, Heaton, Silver, NGC MS61 ..
AB449, Egypt (Occupation Coinage) 10 Piastres AH1335 (1916) Silver, NGC MS61 ..
AB450, Egypt (Occupation Coinage) 20 Piastres AH1335 (1916) Silver, NGC MS65, Pop 2/0 ..
AB535, Egypt (Occupation Coinage) 1 Millieme 1917-H, Heaton, NGC MS63 ..
AB536, Egypt, Farouk, 10 Milliemes AH1357/1938, NGC MS64BN ..
AB649, Egypt, National Bank, 10 Pounds 1947-50, Pick# 23c, Leith-Ross, PMG 64 ..
AB672, Ottoman Empire, Egypt, Abdulmecid, 1 Para AH1255/6, Misr, NGC MS64BN, Pop 1/0 ..
AB673-R, Ottoman Empire, Egypt, Abdulaziz, 20 Para AH1277/5, Misr, NGC MS62 ..
AB674, Ottoman Empire, Egypt, Abdulhamid, 5 Piastres AH1293/17-W, Berlin, Silver, NGC MS64 ..
AB675, Egypt, Fuad, 2 Piastres AH1338 / 1920-H, Heaton, NGC MS64 ..
AB777, Ottoman Empire, Egypt, Abdulaziz, 100 Qirsh AH1277/7, Misr, Gold, NGC AU58 ..
AB867, Ottoman Empire, Egypt, Abdulaziz, 1 Qirsh AH1277/4, Misr, Silver, NGC AU55 ..
AB868, Ottoman Empire, Egypt, Abdulaziz, 1 Qirsh AH1277/15, Misr, Silver, NGC MS63 ..
AB869, Egypt, Occupation Coinage, 5 Piastres AH1338 /1920-H, Heaton, Silver, NGC MS63 ..
AB870, Egypt, Occupation Coinage, 20 Piastres AH1335 /1916, Silver, NGC MS64 ..
AB871, Egypt, Occupation Coinage, 20 Piastres AH1335 /1917, Silver, NGC MS62 ..
AB934, France & Egypt, Bronze Medal 1930 (Ø68mm, 147g) by Maillard, Cairo Exhibition, Geo..
AC042, Ottoman Empire, Egypt, Abdulhamid II, 1 Qirsh AH1293/4, Misr, Silver, NGC MS62, Pop 1/2 ..
AC043, Egypt, Fuad, 10 Piastres 1923-H, Heaton, Silver, NGC AU58 ..
AC161, Egypt, Bronze Medal 1856 (Ø40mm, 31.5g) Missionary Society, The Flight into Egyp..
AC162, Egypt, Bronze Medal 1856 (Ø40mm, 31.5g) Missionary Society, The Flight into Egyp..
AC226, Egypt, Occupation Coinage, 5 Milliemes AH1335/1917-H, Heaton, NGC MS65 ..
AC277, Ottoman Empire, Egypt, Abdulaziz, 4 Para AH1277/4, Misr, NGC MS64BN ..
AC355, Egypt, Fuad, 2 Piastres 1929 BP, Budapest, Silver, NGC MS63 ..
AC540, Egypt, Order of the Republic, Grand Officer, in Original Box ..
AC542, Egypt, Fuad, 5 Milliemes AH1342 / 1924, NGC MS62 ..
AC558, Ottoman Empire, Egypt, Abdulaziz, 40 Para AH1277/10, Misr, XF-AU ..
AC674, Ottoman Empire, Egypt, Abdulaziz, 1 Qirsh AH1277/3, Misr, Silver, NGC AU55 ..
AC675, Ottoman Empire, Egypt, Murad V, 1 Qirsh AH1293/1, Misr, Silver, NGC XF45, Rare! 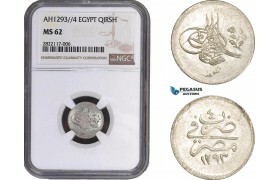 AC675, Ottoman Empire, Egypt, Murad V, 1 Qirsh AH1293/1, Misr, Silver, NGC XF45, Rare! 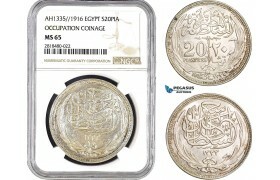 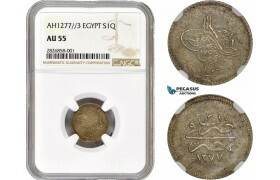 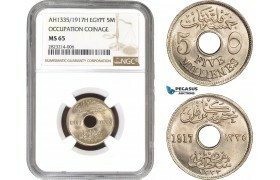 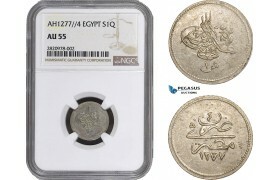 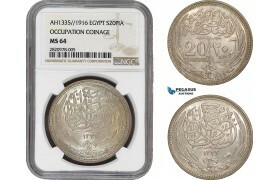 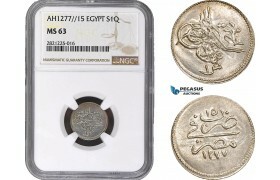 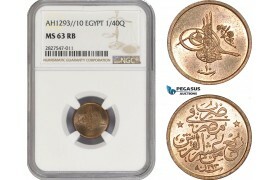 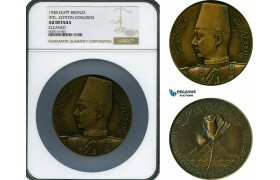 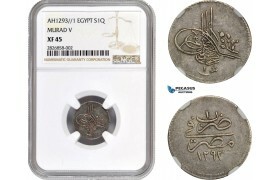 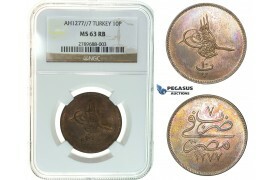 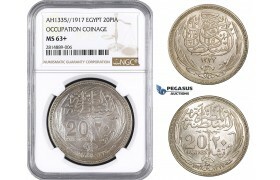 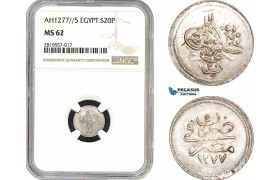 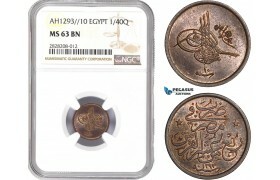 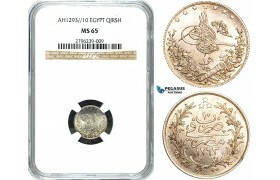 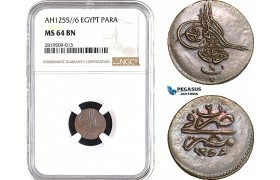 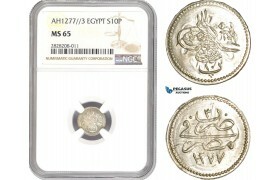 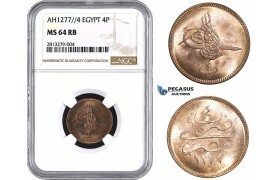 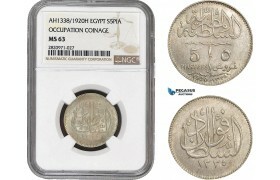 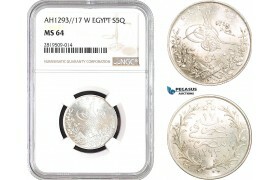 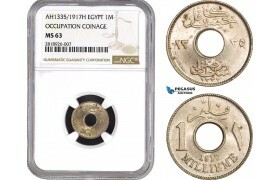 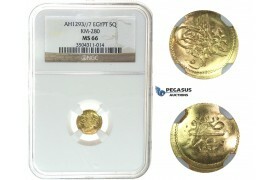 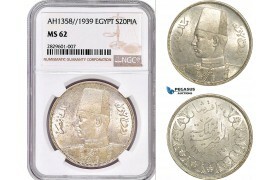 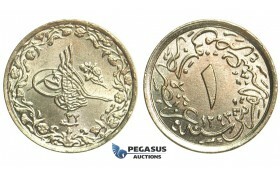 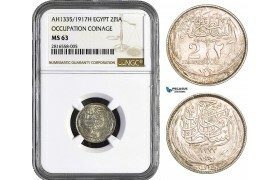 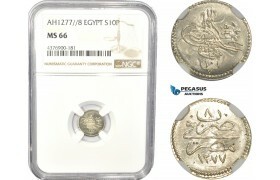 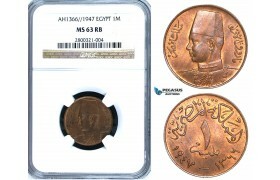 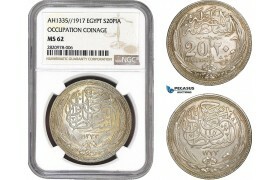 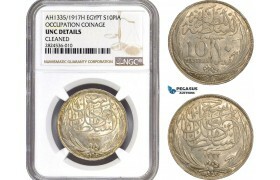 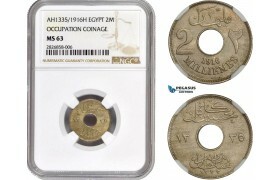 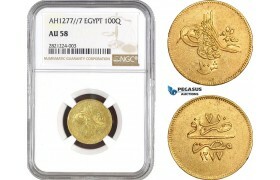 ..
AC676, Ottoman Empire, Egypt, Abdul Hamid II, 1/40 Qirsh AH1293/10, Misr, NGC MS63RB ..
AC677, Ottoman Empire, Egypt, Abdul Hamid II, 1/20 Qirsh AH1293/26, Misr, NGC MS63BN ..
AC678, Egypt (Occupation Coinage) 2 Milliemes AH1335 (1916) NGC MS63 ..
AC679, Egypt (Occupation Coinage) 10 Piastres AH1335 (1917) Silver, NGC UNC Details ..
AC680, Egypt, Fuad, 2 1/2 Milliemes AH1352 / 1933, NGC MS63 ..
AC681, Egypt, Fuad, 5 Milliemes AH1360 / 1941, NGC MS65 ..
AC682, Egypt, Fuad, 5 Milliemes AH1360 / 1941, NGC MS65 ..
AC683, Egypt, Farouk, 10 Milliemes AH1357 / 1938, Bronze, NGC MS64RD, Top Pop ..
AC684, Egypt, Farouk, 10 Milliemes AH1357 / 1938, Bronze, NGC MS63RD ..
AC685, Egypt, Farouk, 10 Milliemes AH1362 / 1943, NGC MS64RD ..
AC686, Egypt, Farouk, 10 Milliemes AH1362 / 1943, NGC MS64RD ..
AC805, Ottoman Empire, Egypt, Abdul Aziz, 10 Para AH1277/8, Misr, Silver, NGC MS66 ..
AC838, Ottoman Empire, Egypt, Mehmed Reshad V, 10 Piastres AH1327/4-H, Heaton, Silver, Toned AU-UNC ..
AC839, Ottoman Empire, Egypt, Mehmed Reshad V, 20 Piastres AH1327/6-H, Heaton, Silver, Toned AU (Lig..
AC864, Ottoman Empire, Egypt, Abdul Aziz, 10 Para AH1277/3, Misr, Silver, NGC MS65, Pop 8/0 ..
AC865, Ottoman Empire, Egypt, Abdul Hamid II, 1/40 Qirsh AH1293/10, Misr, NGC MS63BN ..
AC973, Egypt, Fuad, 5 Piastres AH1348 / 1929-BP, Budapest, Silver, NGC MS63 ..
AC974, Egypt, Farouk, 10 Piastres AH1356 / 1937, Silver, NGC MS63 ..
AC975, Egypt, Farouk, 10 Piastres AH1358 / 1939, Silver, NGC MS62 ..
AD087, Egypt, Bronze Medal 1938 (Ø69mm) by Turin & Metcalfe, International Cotton Congres..
AD190, Ottoman Empire, Egypt, Abdul Hamid II, 5 Qirsh AH1327/2-H, Heaton, Silver, NGC MS63 ..
AD191, Egypt (Occupation coinage) 5 milliemes 1917-H, Heaton, PCGS MS65 ..
AD192, Egypt, Farouk, 2 Piastres AH1356 / 1937, Silver, NGC MS66, Pop 2/0 ..
AD193, Egypt, Farouk, 20 Piastres AH1358 / 1939, Silver, NGC MS62 ..
E66, Egypt, Farouk, 10 Piastres 1938, Silver, High Grade ..
G54, Ottoman Empire, Egypt, Abdül Hamid II, 2 Qirsh AH1293/33-H, Heaton, SIlver, NGC MS63 ..
I38, Ottoman Empire, Egypt, Abdülaziz, 10 Para AH1277/7, Misr, NGC MS63RB (Error on slab! 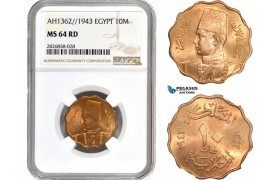 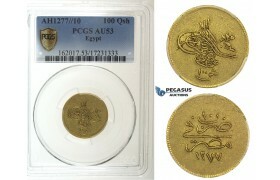 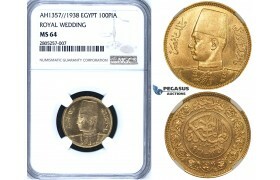 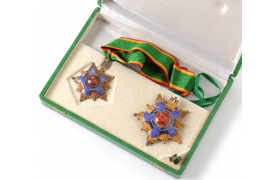 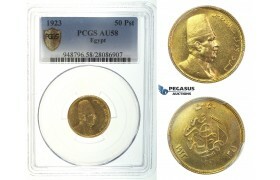 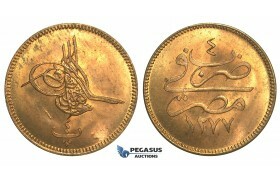 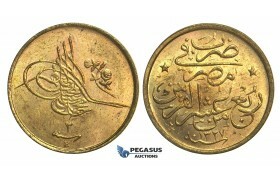 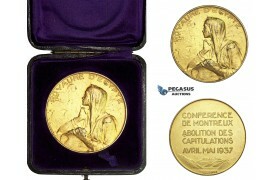 This ..
I39, Ottoman Empire, Egypt, Abdülaziz, 100 Qirsh AH1277/10, Gold, Misr, PCGS AU53 ..
I40, Ottoman Empire, Egypt, Abdülhamid II, 5 Qirsh AH1293/7, Misr, Gold, NGC MS66 ..
I41, Egypt, Fuad, 50 Piastres 1923, Gold, PCGS AU58 ..
L70, Ottoman Empire, Egypt, Abdulaziz, 4 Para AH1277/4, Misr, Mint State! 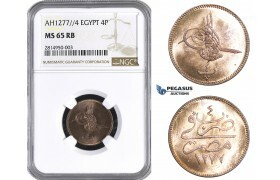 L70, Ottoman Empire, Egypt, Abdulaziz, 4 Para AH1277/4, Misr, Mint State! ..
L71, Ottoman Empire, Egypt, Abdulhamid, 1/10 Qirsh AH1293/32-H, Heaton, Brilliant UNC ..
L72, Ottoman Empire, Egypt, Mehmed Resad, 5 Qirsh AH1327/4-H, Heaton, Silver, Mint State! 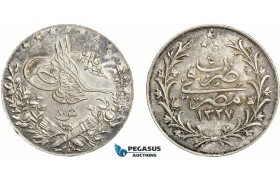 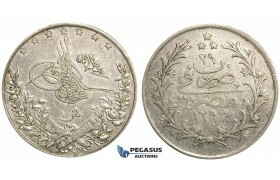 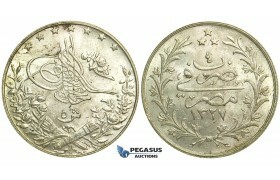 L72, Ottoman Empire, Egypt, Mehmed Resad, 5 Qirsh AH1327/4-H, Heaton, Silver, Mint State! 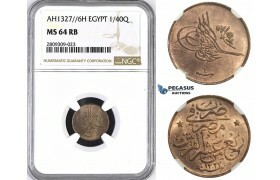 ..
L73, Ottoman Empire, Egypt, Mehmed Resad, 1/40 Qirsh AH1327/3-H, Heaton, Mint State! 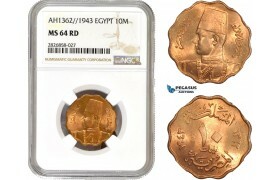 L73, Ottoman Empire, Egypt, Mehmed Resad, 1/40 Qirsh AH1327/3-H, Heaton, Mint State! 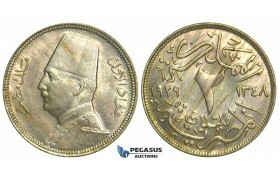 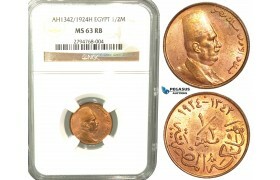 ..
L74, Egypt, Fuad, 2 Milliem 1929, Mint State! 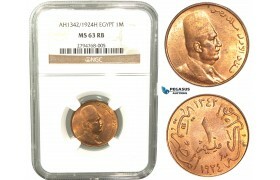 L74, Egypt, Fuad, 2 Milliem 1929, Mint State! 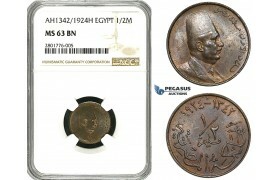 ..
L99, Egypt, Fuad, 10 Milliem AH1352/1933-H, Heaton, NGC SP64, Rare Grade! 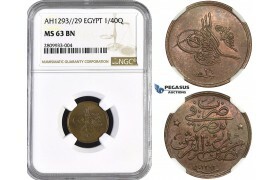 L99, Egypt, Fuad, 10 Milliem AH1352/1933-H, Heaton, NGC SP64, Rare Grade! 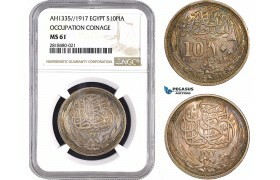 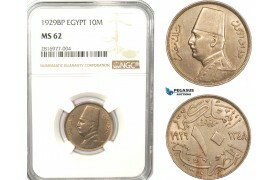 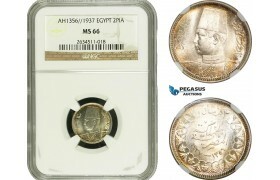 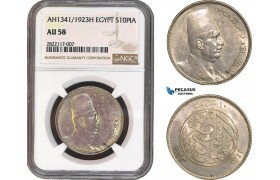 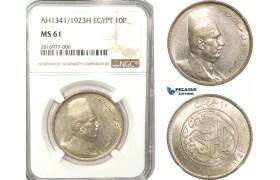 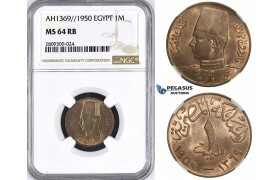 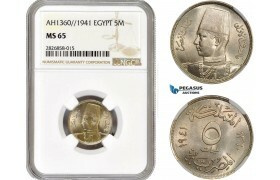 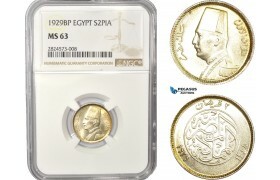 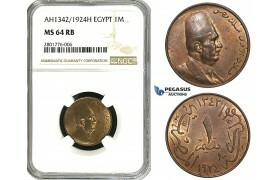 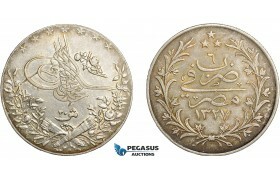 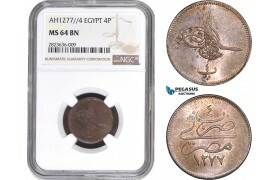 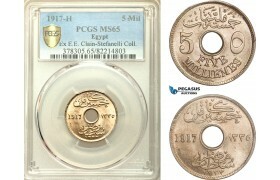 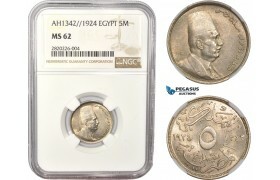 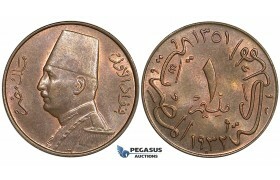 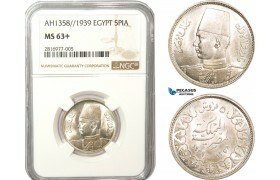 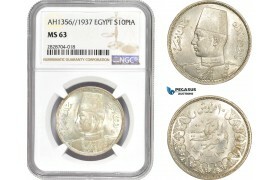 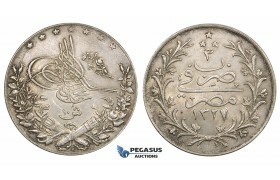 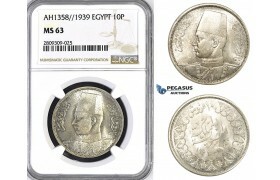 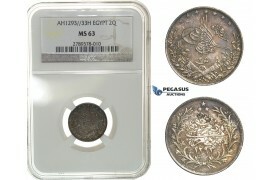 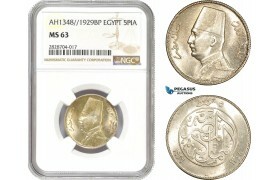 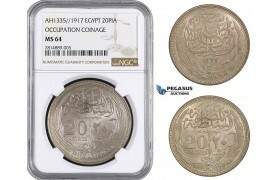 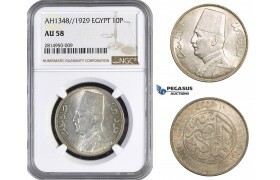 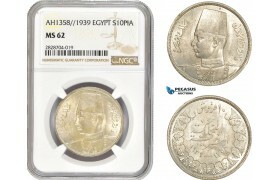 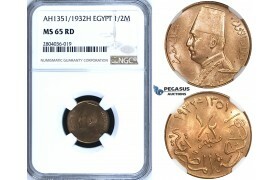 ..
P65, Ottoman Empire, Egypt, Abdülaziz, 40 Para AH1277/10, Misr, NGC PF65BN (Pop 1/1, No finer) ..
R694, Egypt, Fuad, 1/2 Millieme AH1351/1932-H, Heaton, NGC MS65RD ..
R695, Egypt, Fuad, 10 Piastres AH1341/1923-H, Heaton, Silver, NGC AU55 ..
U35, Ottoman Empire, Egypt, Abdülhamid II, 10 Qirsh AH1293/29, Misr, Silver, Nice! 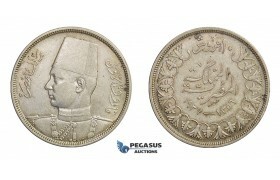 U35, Ottoman Empire, Egypt, Abdülhamid II, 10 Qirsh AH1293/29, Misr, Silver, Nice! 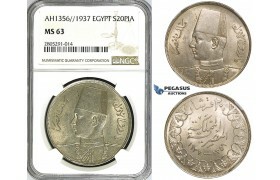 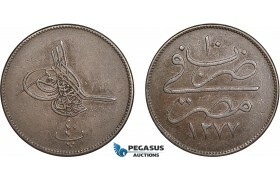 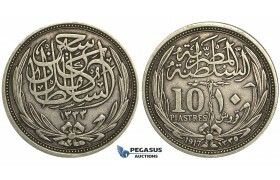 ..
U36, Egypt, Hussein Kamil, 10 Piastres AH1335 (1917) Silver, Nice! 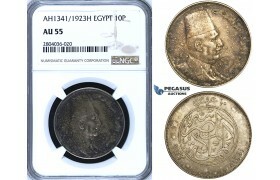 U36, Egypt, Hussein Kamil, 10 Piastres AH1335 (1917) Silver, Nice! 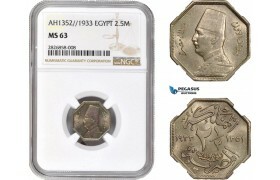 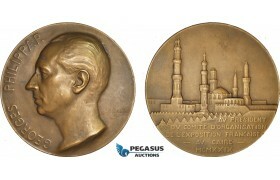 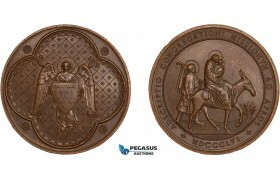 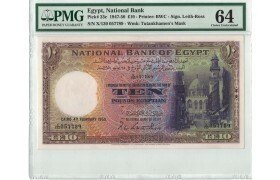 ..
V30, Egypt, Fuad, 1/2 Millieme AH1342/1924-H, Heaton, NGC MS63 ..
V31, Egypt, Fuad, 1 Millieme AH1342/1924-H, Heaton, NGC MS63 ..
Y28, Ottoman Empire, Egypt, Abdül Hamid II, Qirsh, AH1293/10 W, Berlin, Silver, NGC MS65 (Pop 1..
ZA60, Egypt, Farouk, 1 Millieme AH1366 (1947) NGC MS63RB ..
ZB90, Egypt, Fuad, 1/2 Millieme AH1342/1924-H, Heaton, NGC MS63BN ..
ZB91, Egypt, Fuad, 1 Millieme AH1342/1924-H, Heaton, NGC MS64RB ..
ZG60, Egypt, Farouk, 100 Piastres AH1357/1938 (Royal Wedding) Gold, NGC MS64 ..
ZI39, Egypt, Farouk, 20 Piastres AH1356 / 1937, Silver, NGC MS63 ..
ZI84, Egypt, Fuad, 1 Millieme AH1351/1932-H, Heaton, UNC ..
ZM399, Ottoman Empire, Egypt, 1/40 Qirsh AH1327/6-H, Heaton, NGC MS64RB ..
ZM400, Egypt, Farouk, 1 Milliem AH1369 (1950) NGC MS64RB ..
ZM401, Egypt, Farouk, 10 Piastres AH1358 (1939) Silver, NGC MS63 ..
ZM536, Ottoman Empire, Egypt, Muhammad V, 10 Qirsh AH1327/3-H, Heaton, Silver, XF-AU ..
ZM567, Ottoman Empire, Egypt, Abdul Hamid II, 1/40 Qirsh AH1293/29, NGC MS63BN ..